Kumulani at Mauna Kea guests experience a landmark of luxury between two of Hawaii’s most esteemed five-star vacation resorts. Top-floor condos with wraparound, covered and furnished lanais invite you to soak in the sunrises and sunsets amidst immaculate ocean views. Inside, the two bedrooms, two baths, a den with fold-out sofa, and living and dining great room with fully equipped kitchen accommodate up to six comfortably. Make footprints in the famed crescent white-sands of Kauna’oa Beach, renowned as one the top beaches in the world. 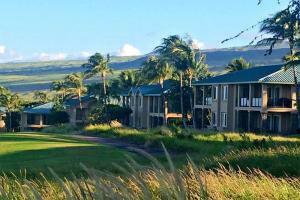 Tee off in Hapuna on the “links-style Arnold Palmer/Ed Seay designed course known for its dramatic elevation changes. Or take a swing at the par three third hole in Mauna Kea, one of the most spectacular holes in all of golf. The acclaimed oceanside tennis facility stands without peer. Signing privileges at Mauna Kea Beach Hotel’s and Hapuna Beach Prince Hotel’s pools, restaurants, salon, spa, gym and beach services make this island vacation complete.